Wonder what Matt Sorum's been up to while Velvet Revolver are on downtime? Sorum backed former The Runaways frontwoman Cherie Currie earlier this week in California. You can check out the sticksman's performance in the videos below. 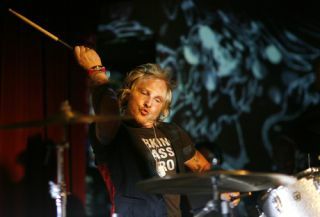 While Sorum seems to be keeping himself busy, fellow ex-GN'R drummer Steven Adler has had plenty to say on his former bandmates over the last few weeks. Adler recently hinted that he, Slash, Duff McKagan and Izzy Stradlin would all be up for a GN'R reunion, but added that Axl would need to be in on the deal for anything to go ahead.